The Italian Renaissance Revival style finds a great champion today in New York designer Matthew White. His work holds high clearness, nobleness, and sociability in its own solid embrace while creating country villas and city apartments with the symmetry, proportion, order, continuity, and definition of the Italian Renaissance, all gracefully and poetically translated for the comforts of contemporary high-style living. 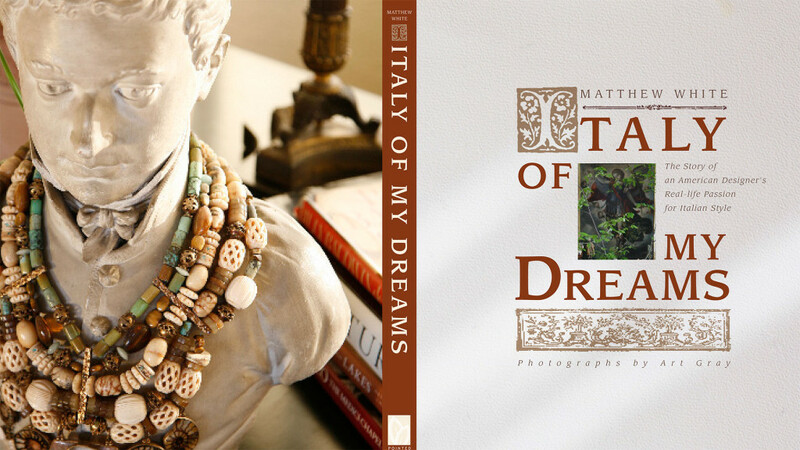 Italy of my Dreams–the Story of an American Designer’s Real Life Passion for Italian Style is Matthew White’s first book. It shares his deep love for Italy and how it inspires his own personal style. From the moment he first stepped foot in Italy, his aesthetic was forever changed. Following that initial visit were many more, augmented by a more serious study of the art, architecture and decorative arts of Italy, from antiquity to today. Italy of my Dreams shares superb examples of Italian architecture and design that inspired great American tastemakers such as Thomas Jefferson, Edith Wharton and Stanford White. Each chapter culminates with Matthew White’s own interpretation of Italian style. Lush imagery, touching stories and inspirational design make Italy of my Dreams a must for anyone who loves Italy, and for those who have a profound interest in interior decoration, architecture, garden design, entertaining and collecting. In these pages, I share how I was seduced by Italy, and how that seduction affects the style in which I live. Just as the grand tour so deeply affected travelers three hundred years ago, Italy continues to move and inspire me. So this is my “grand tour” of sorts, a tour of my Italian-inspired homes, past and present. Each one of these houses, whether situated in town or country, East Coast or West, link three essential elements: love of domesticity, love of beauty, and love of Italy. There’s an old Tuscan proverb that says “Man makes the place, and the place makes the man.” From my earliest days at the trailer park I have pursued one thing — beauty. I may have found it in Italy, but I made it at home. It was from a train that late September evening when we first laid eyes on Venice. Night was falling, and our view through the window as we crossed the lagoon made the city appear as a sleeping giant lying thin and elegant on the water. I knew I would love Venice long before we had even begun to plan the trip, long before I arrived there. Venice represented to me a city from a different realm. A place not really of this world. How else could one explain a city of stone palaces built on water? Il Poggio and various other great Tuscan houses would inspire architects, artists and writers for centuries. Edith Wharton wrote the book Italian Villas and their Gardens as a way to share her enthusiasm for these romantic places. Bernard Berenson, the famous art historian who specialized in the Renaissance, lived in a charming villa in Fiesole, just outside of Florence. These nineteenth and early twentieth-century American tastemakers understood the architectural importance of the Italian country house and were in part responsible for bringing that understanding to a larger audience in the modern age. Monticello was unique in eighteenth-century America in that it looked back to the great buildings of Palladio and ancient Rome yet seemed very contemporary. And because of Jefferson’s ingenuity, the house incorporated some original and very American ideas. The concept of referring to the romance of European history while living in the present and casting an eye toward the future is a completely American trait. Charles McKim said…”As Rome went to Greece, and later France, Spain and other countries had gone to Rome for their own reactions to the splendid standards of Classic and Renaissance Art, so must we become students, and delve, bring back, and adapt to conditions here, a groundwork on which to build.” More than a century later, I was inspired to follow a similar path. By taking inspiration from the past — ancient Rome, Renaissance Italy, and Stanford White’s New York — I created a place for living in the twenty-first century. The result is a home steeped in two millennia of Italian history yet created by, and for, Americans. No city in the world is a more alluring melting pot of Eastern and Western styles than Venice. Every arched window and each glittering façade stands as glamorous testament to the admiration Venetians had for the art and architecture of the Eastern Mediterranean. And yet each architectural element shows how Venice took that style and made it uniquely its own. Book signing, lecture and reception at Revival Antiques to benefit the Pasadena Museum of History. Revival Antiques, Pasadena, CA.